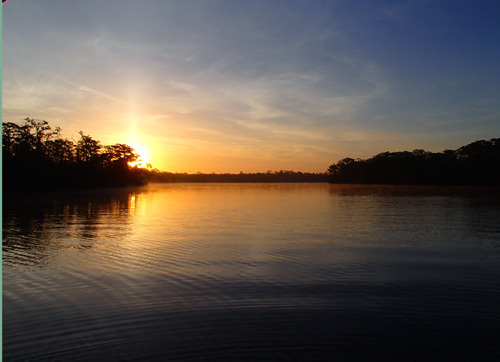 It may be called the Dismal Swamp but we often have some beautiful days in there, and this was the start of one of the pretty ones. We had to go through a second lock which took a bit of time seeing so many snowbirds were returning north.You can see how crowded it can get. The water is filling in at the South Mills Lock. This is actually the first lock we went through. 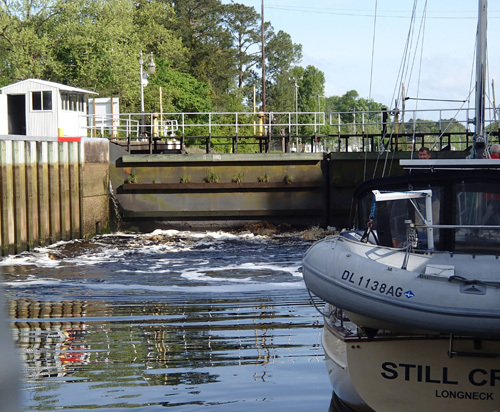 You can see by looking at the sides of the lock that we rise about eight feet. The next day people were getting anxious to get out of the lock because they were trying to make a bridge that was about 55min. away. They zoomed out almost causing an accident but missed the bridge opening by minutes and then had to motor around for an hour until the next opening. Al trying to stay warm! After having a beautiful day in the Dismal Swamp the day before, this day was drizzly and cold! I think it was the most layers we had on the entire trip and that was on May 4th. 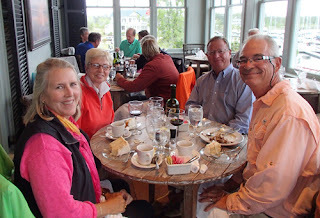 We went into Hampton Piers to dock the boat and our friends, Dave and Toni Mershon whisked us away to their house in Williamsburg where it was nice and warm. We had a grand time visiting and sightseeing. 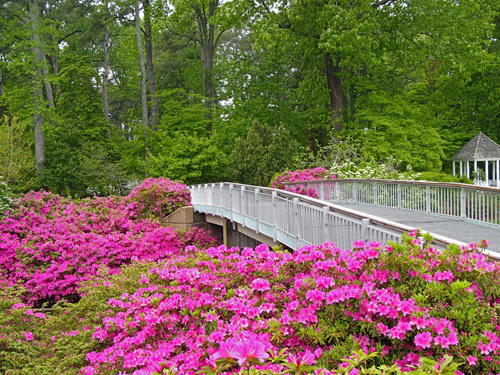 We went to Norfolk Botanical Gardens. 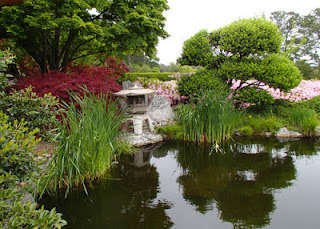 It was a bit chilly that day but the flowers and scenery were gorgeous. 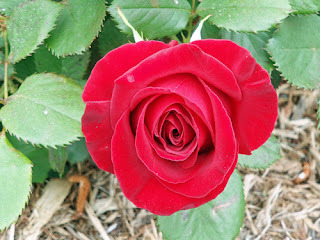 If you have not picked up on it yet, the three things I love to photograph are sunrises, sunsets and flowers. 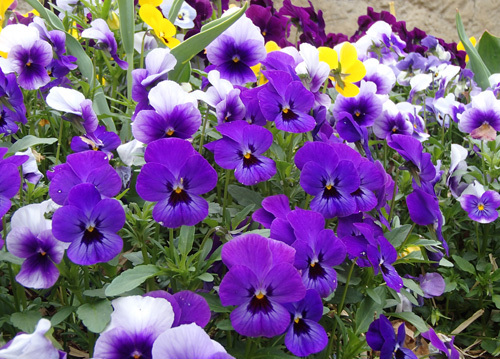 The contrast of colors are amazing. Glass and metal fish sculptures in a pond. 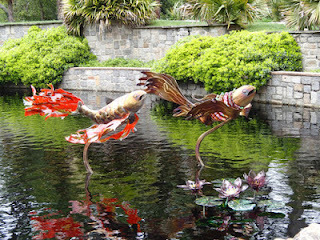 There was a glass sculpture exhibit throughout the massive gardens entitled "Reflections of Nature." The fish are only one of numerous designs. 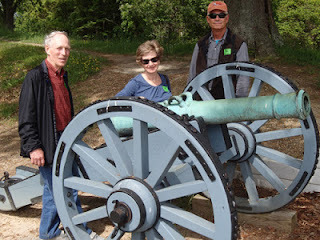 The next day we visited Jamestown and refreshed our history lessons from many years ago. It still amazes me how our forefathers fought back then and that anyone came back alive. The following day we went to the Muscarelle Museum at William and Mary which is an art museum. We got some to see some amazing wooden block prints and lithographs as well. After lunching in Williamsburg they drove us back to our boat. 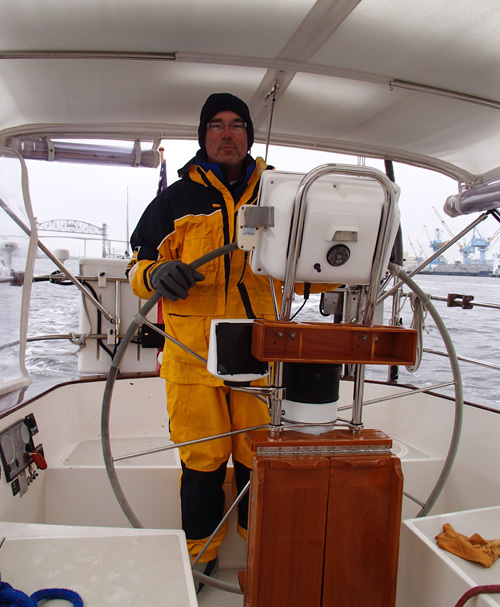 It worked out perfectly, because the days we visited with them, we would not have gone out in the bay due to strong northerly winds. We left the next day and you can see how brilliant and calm the waters were leaving the Hampton area. It was the same in the bay. We anchored at Reedville and it rained most of the evening and night. However, we awoke to blue skies and sunshine and are headed to the Solomon Islands. 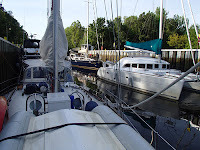 We will be back at our marina this weekend so this is the last blog for the season. I hope you enjoyed reading our adventures as much as we loved experiencing them. Leaving Hampton under blue skies. The old southern houses along the waterfront. We made a stop at a place we had never been before, Southport, NC. We were glad we did. 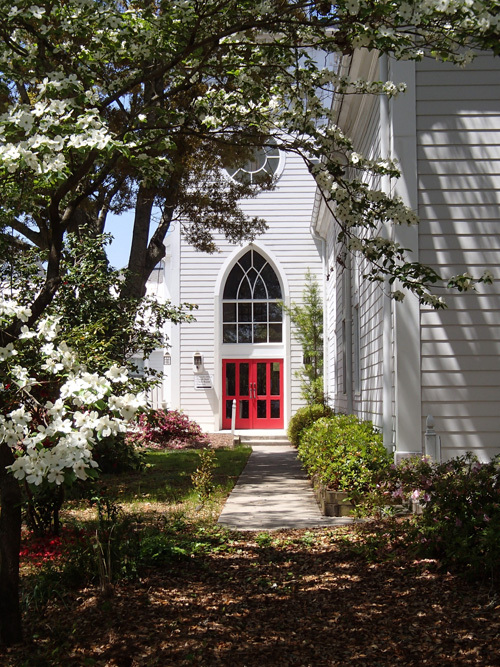 It was a charming southern town with the large older homes along the water front and many quaint churches and shops. The dogwood blossoms made great framing for this church. 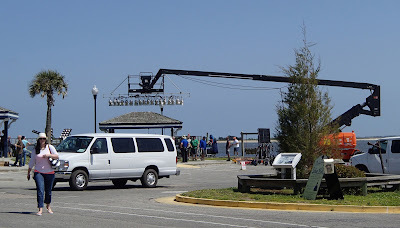 It was also interesting because the day we were there, they were shooting a scene for the new show that comes out in June on CBS called Under the Dome. We saw a lot of the equipment and one scene but no big stars. 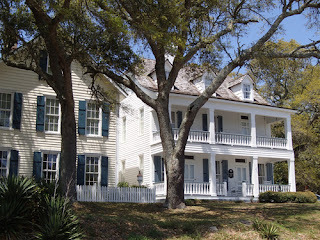 We did learn that this town and Wilmington, NC are used often for shows and movies. 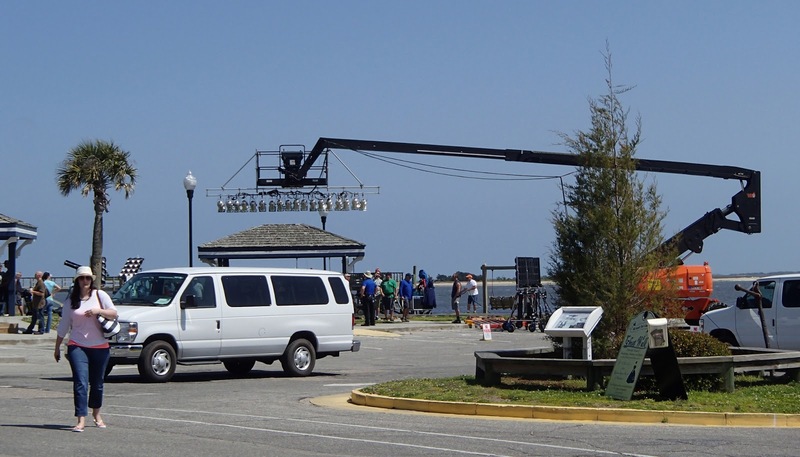 Even parts of the TV show, Revenge, which supposedly takes place in the Hamptons is shot here. 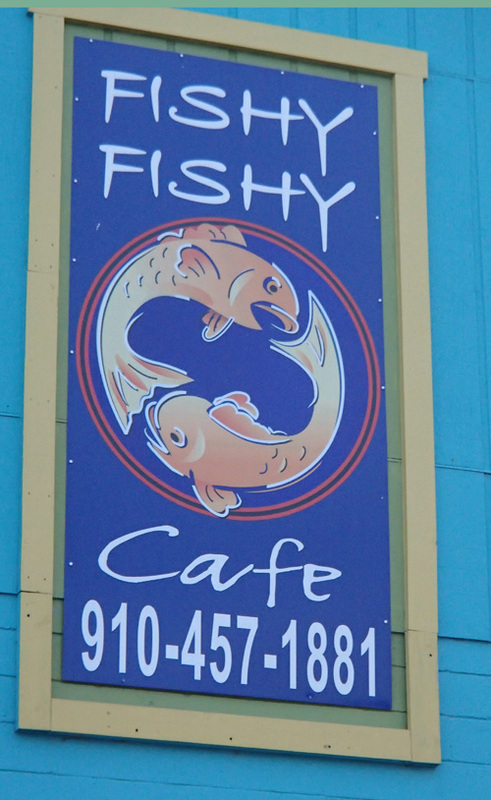 We had another enjoyable meal at the place recommended by many, called Fishy Fish. I actually have become tired of so much seafood so I chose a wonderful Walnut Apple Spinach Salad! 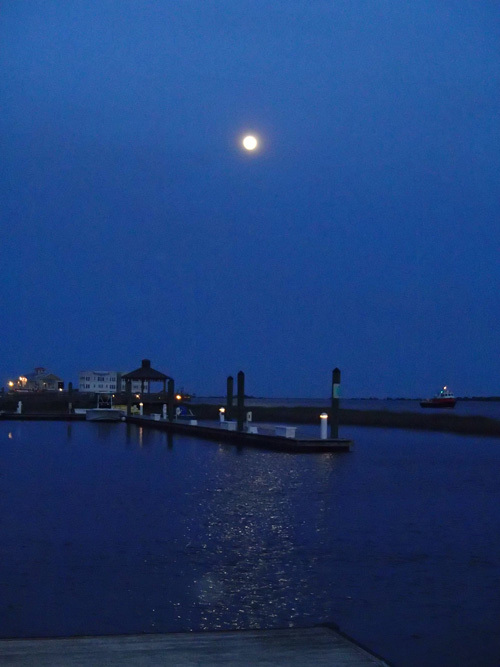 Full moon from the docks of Southport Marina. 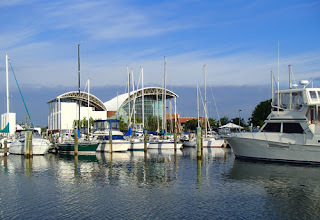 We stayed at Southport Marina which was a very nice facility. It had great floating docks and nice bathrooms. 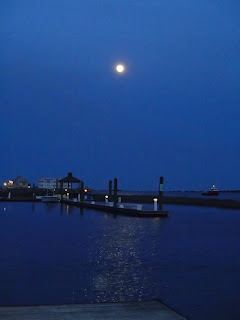 But the view that night was the greatest, with the full moon reflecting in the water. 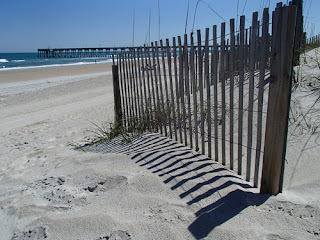 The next day we moved onto Wrightsville Beach which was definitely a different atmosphere. It is a beach town with lots of young people all around. They were having a paddle board race on Saturday so there were many twenty-somethings out in their very little swim suits paddling all around our boats. We are sitting there in our fleece and jeans but they had on their swim suits! Oh, to be young again. The men in the anchorage thoroughly enjoyed the sites. I on the other hand enjoyed the beach. 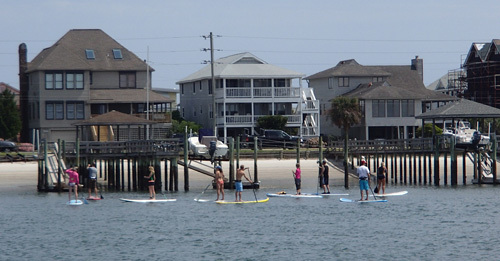 The craze of paddle boarding has taken over! The next day we left to anchor in Mile Hammock along with about eight other boats going through all the bridges with us. There ended up about 15 boats in anchorage who seemed to keep coming in even after we went down below after dark. Some rainy weather was predicted so we decided to head in to River Dunes Marina just north of Oriental, NC. 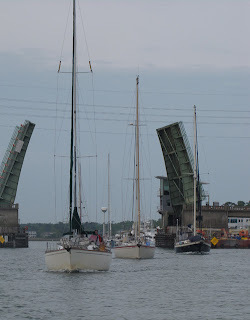 Thirteen other boats decided the same thing along with our friends on Summersalt, John and Susie, and Five and Dime with Curt and Kathy. 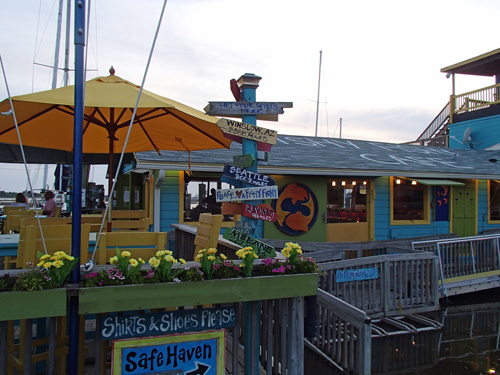 Since they had so many boats come in, the manage called the chef and staff to come in on a Monday for a cruiser's dinner. A one selection entree with salad, veggie, rolls and dessert for a set price. After raining all day it felt good to go to the restaurant and sit in real chairs and talk to other cruisers. Enjoying our cruiser meal at River Dunes. 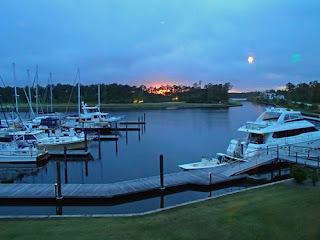 Our rainy day ended with a sunset and moon rise from the window of the restaurant. So now we are in the Dismal Swamp because the winds were against us to go up the Virginia Cut. We plan to meet up with our old friends Dave and Toni Mershon to see their new home in Williamsburg this weekend. It will be nice to get off the boat for a few days. 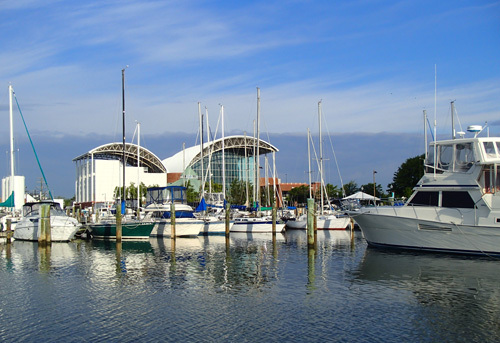 It won't be long now until we are back at our home marina!